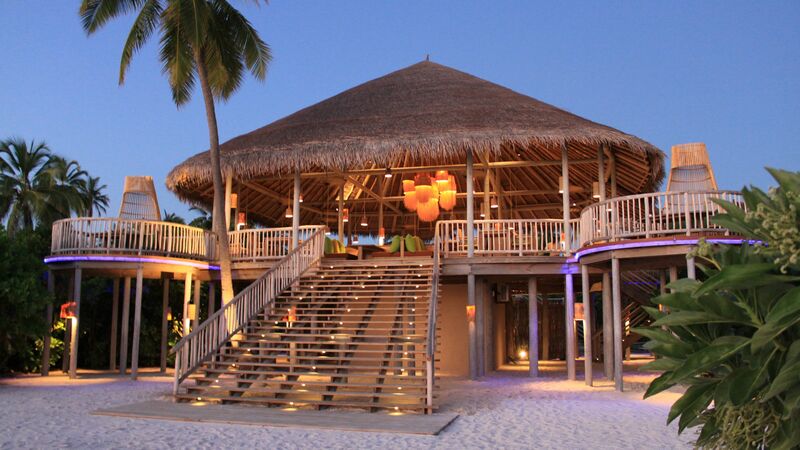 The Six Senses Laamu is the perfect hotel for couples and groups wanting to relax, unwind and recharge. It’s full of wonderful luxury touches, including five star service and facilities, a secluded feel and a full spa. Choose from a range of treatments during your stay and leave feeling fully revitalised and ready to enjoy your escape. 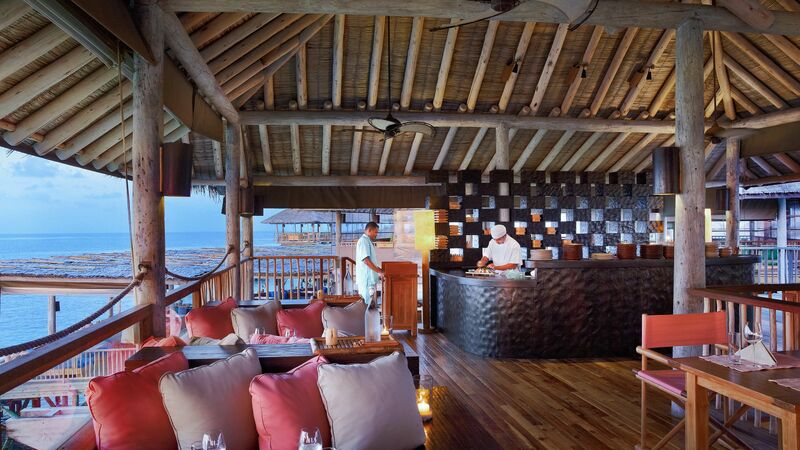 Choose from land or water villas and enjoy modern facilities mixed with rustic details. Spend your days relaxing on the beach, by the swimming pool or taking part in some of the water sports available. Snorkel with dolphins, turtles and parrotfish, surf one of the Maldives’ most famous waves or try a night dive and experience the magical underwater world in a unique way. Child prices apply to ages 0 - 11 years. Overlooking the hotel’s organic garden which stretches down to the white sands of the beach, this is the perfect place to relax as you dine al fresco. Enjoy a menu of fresh fish and produce at your private table or the communal table. Top dishes include squid ink pasta, seafood mousse and lamb kofta. Traditional Japanese dishes with a modern twist are served in this chic, modern restaurant overlooking the sea. Favourite items include the sushi boat, gyoza and udon noodles. A two storey open deck allows you to enjoy views of the sea as you dine. Breakfast and dinner are served a la carte and include dragon fruit salad, lobster linguini and fish curry. 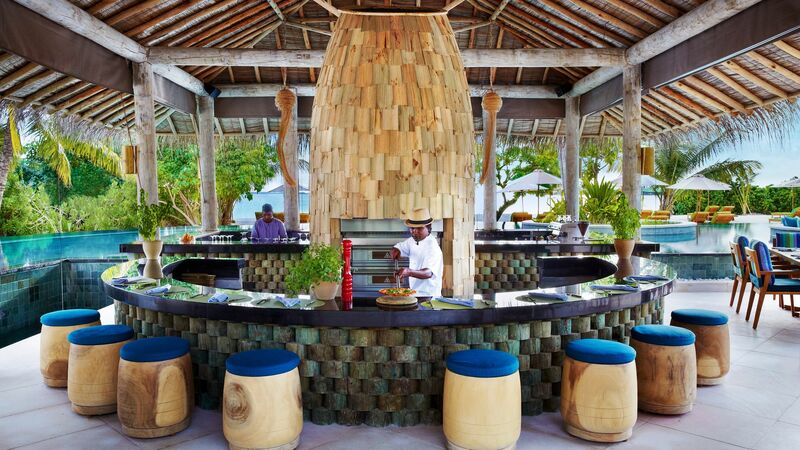 This sunken bar is located next to the swimming pool and offers a casual dining option, perfect for light bites and meals throughout the day. The menu includes salad bowls, tacos, burgers and pizzas. Set over several levels and with a cool vibe, enjoy a delicious cocktail as you watch the sunset. Pizzas, seafood and finger food are also served here. Create your own ice cream combinations in this al fresco space, with herbal teas, mojitos and chocolate truffles also available. Ice cream flavours include champagne, avocado and more. 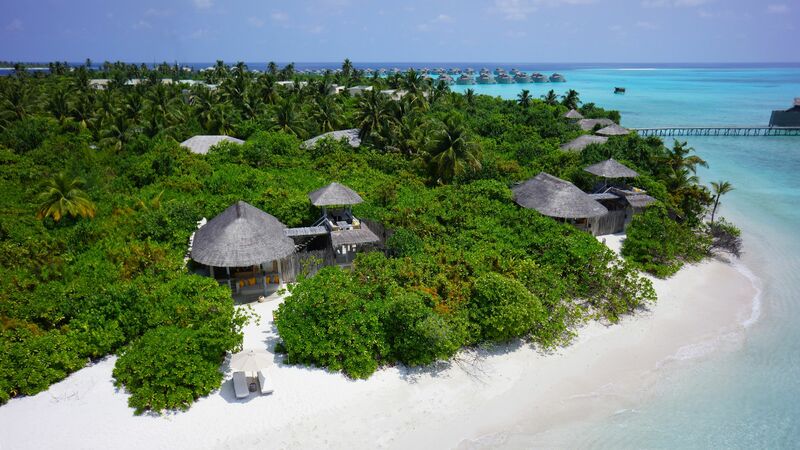 Six Senses Laamu is situated on its own small island in the Maldives and is surrounded by white sandy beaches and the ocean. The hotel’s swimming pool is overlooked by loungers and a sun terrace and offers beautiful views over the beach. Located right on the beach, enjoy massages and other treatments as you listen to the sound of the waves. Couples’ treatment nests are perfect for a romantic break and you can also enjoy a wellness screening. The fully air conditioned gym has a range of fitness equipment, including cardio machines, as well as floor to ceiling windows with views of the sea. A range of yoga classes and programmes will help improve your mind, body and balance. Choose the yoga detox or yogic sleep option. Try some of the many water sports available from the hotel, including wake boarding and water skiing on the calm early morning waters, and windsurfing and catamaran sailing during the day. 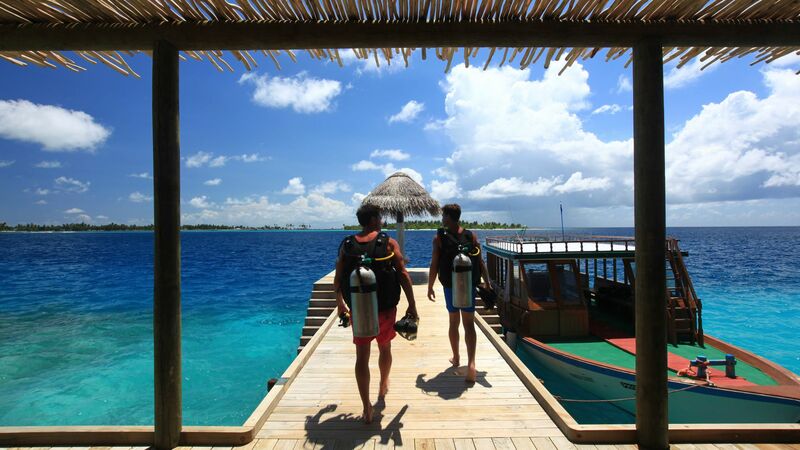 Take all day scuba diving trips and discover the spectacular reefs of the Maldives. There is also a night dive for a unique view, as well as snorkelling excursions. Perfect for a romantic evening, enjoy a candlelit barbecue dinner as you listen to the sound of the waves and enjoy the cool breeze on your own secluded sandbank. Spend the day visiting some of the other islands in the Maldives, learning about the lives of the residents. Visit a school, mosque and boat building area, before enjoying a picnic on a deserted island. Enjoy your very own deserted stretch of sand as you picnic under the palm trees, swim and snorkel in the crystal clear waters. The picnic lunch includes delicious local produce and a bottle of wine. The Maldives’ most famous wave breaks just offshore and is accessible from Six Senses Laamu. Alternatively, beginners can try some smaller waves. A visit to this larger, nearby island is the perfect way to immerse yourself in Maldivian culture. Wander through the streets, visit a school, mosque and local home, as well as the shops. You can also hike to a lake in the heart of the island. 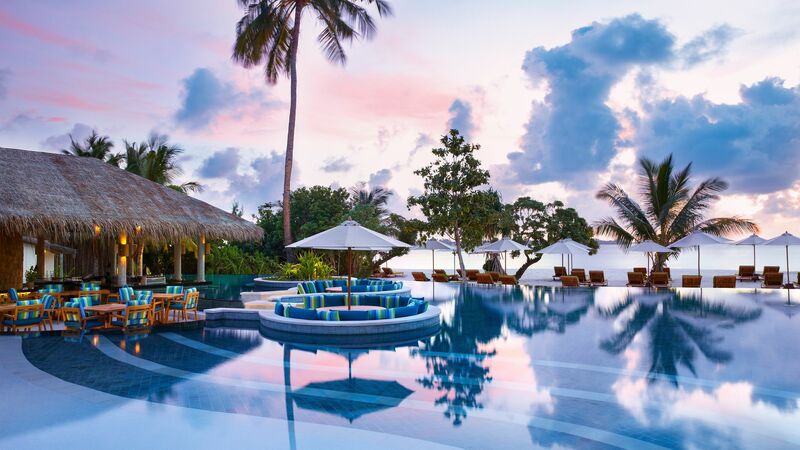 Located on its own stunning island, the Six Senses Laamu is the perfect place for a desert island holiday in the Maldives. The island is surrounded by white sandy beaches while in the centre you’ll find lush gardens, palm trees and more. One of the Maldives’ most famous wave breaks, the Yin Yang, is just off the shore and there are also smaller waves for beginner surfers. There are plenty of opportunities to explore the nearby islands, with island hopping tours available from the hotel. Visit schools, mosques and towns, as well as hiking through rainforests to reach waterfalls and lakes. Other water sports include sailing and water skiing, as well as scuba diving and snorkelling. The Maldives is well known for its fascinating underwater life and you can try snorkelling from the hotel itself or take day trips to see dolphins, turtles and desert islands. The Six Senses Laamu is reached via a 35 minute private flight followed by a 15 minute speedboat ride from Malé International Airport. Tucked away in the luscious hotel gardens facing the lagoon, enjoy romantic serenity in these luxurious villas. An outdoor terrace is perfect for relaxing and the beach is a few metres away. There is also a private rear garden with an outdoor shower and bathtub. On top of the villa you have a dining deck with panoramic views. Guests can also choose from king or twin beds. Hidden within the hotel’s beautiful gardens this is the ideal villa for a private getaway, close to the beach and with its own garden and easy access to the beach. There is also an outdoor shower and bath, as well as a dining deck with panoramic views of the gardens and the sparkling ocean. Choose from king or twin beds. Set in the luscious hotel gardens and surrounded by trees and white sands, this villa offers easy access to the beach and a secluded getaway. There is a private garden and terrace with an outdoor bathtub and shower, as well as a treetop deck with a dining and seating area and panoramic views of the ocean and garden. Choose from twin or king beds. Located on the sunset side of the island and overlooking the Indian Ocean, these villas will help you get away from it all. Enjoy views of the ocean from your private garden and swimming pool, as well as an outdoor bathtub and shower hidden by branches. Your treetop deck offers panoramic views of the ocean and hotel gardens, with a seating and dining area perfect for watching the sunset. Choose from twin or king size beds. Surrounded by the Indian Ocean at the end of a wooden jetty, enjoy direct access to the sea. There is an overwater hammock, a glass dining table, outdoor rain shower with privacy screens and an outdoor glass bathtub. Your treetop terrace is the perfect place for lounging or dinner and offers panoramic views of the ocean. Choose from king or twin size beds. 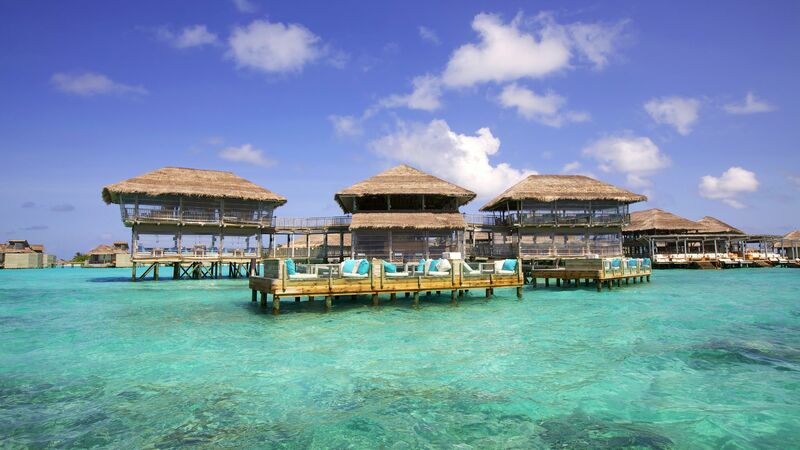 Enjoy direct access to the sparkling Indian Ocean from these rustic villas located on the jetty. Relax on the overwater hammock, swim or snorkel straight from your villa or enjoy the glass dining table and seating area. There is also an outdoor rain shower, a glass overwater bathtub and a treetop deck with beautiful panoramic views. You can also choose from twin or king size beds. Located in the crystal clear waters of the Indian Ocean, just off the timber jetty, these villas have a private pool over the ocean and plenty of space to relax. Unwind on the deck and enjoy the glass dining table, swing in the overwater hammock or snorkel and swim straight from your villa. There is also an outdoor rain shower and overwater glass bathtub. Take in the sunset from your rooftop terrace and choose from twin or king size beds. 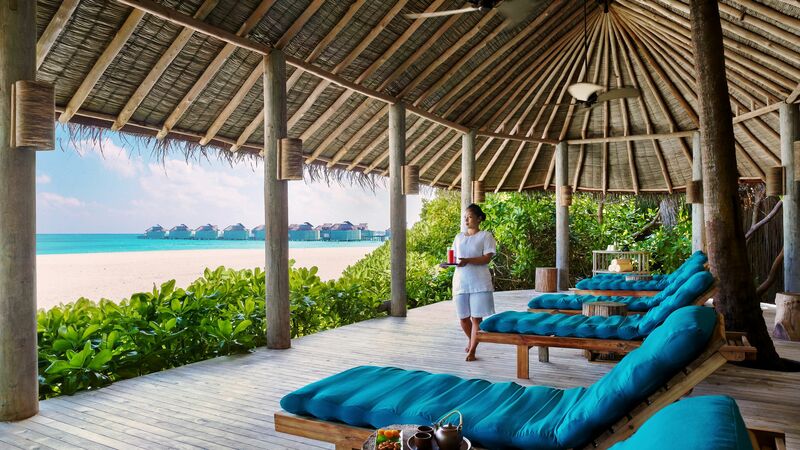 Located along the hotel’s wooden jetties and stretching into the Indian Ocean, these villas offer plenty of space and privacy. Relax as you swing over the sea in your hammock, snorkel or swim straight from your deck and enjoy the glass dining table and relaxing seating area. There is also an outdoor rain shower and a treetop deck with comfortable seating, perfect for watching the sunset. Choose from king or twin size beds. Located along the jetty and stretching over the Indian Ocean, this luxurious villa offers plenty of privacy and luxury facilities. Relax in your private swimming pool and look out over the glittering sea, unwind on sun loungers, or snorkel straight from your deck. There is also a comfortable seating area, glass dining table and a glass bathtub and outdoor rain shower. With close proximity to the hotel’s garden and the sparkling sea, this private villa is perfect for families. Your secluded garden has a seating area and swimming pool and there is a living area, bedroom, two bathrooms and a study which can be turned into a children’s bedroom. There is an open air shower and bathtub and a treetop deck where you can dine and relax as a family. These large villas are hidden within the tranquil hotel gardens, facing the sparkling waters of the lagoon. There are two independent bedrooms with king or twin beds and a large living and dining room in between. The outdoor terrace has a private swimming pool, sun loungers and private access to the beach. There is also an open air shower and bathtub and a treetop deck with a dining table and seating, perfect for watching the sunset. Facing the Indian Ocean and tucked away in the hotel’s luscious gardens this large villa is perfect for privacy. Two beach villas each have their own bedroom and outdoor bathroom, with a living and dining area between the two. There is a garden with sun loungers and a large swimming pool, as well as private beach access. The open air shower and bathtub are surrounded by a privacy screen made of branches and there is also a treetop deck with a dining area and seating, ideal for spectacular sunset views. “ Couldn't find any real area of concern. Amazing place, food, premises and service. I travelled with my large family (4 kids ages of 5,8, 12 and 14 + parent + sister). In total we were 9 staying in 3 Ocean Villas. The hotel is a 10/10 in many ways. The island is equiped with everything you need: amazing scuba center, incredible Surf School, all Water sports you could imagine, Cinema, and incredible gym, and outstanding Spa, 5 restaurants, a free ice-cream bar (with 42 flavours open 10 hours a day). I never write reviews and this time I decided that both the hotel and the staff deserve it. There are so many amenities, so many details and so much love the team puts in making your stay unforgetable that it is very difficult not to be super positive. The GEMs (Guest Experience Managers) are really super helpful, always there, super attentive and super smiley. They solve any issue that you have within seconds of your request. They are super proactive and they make your stay so much easy. The activity book/agenda is amazing both for couples (a lot of romantic alternatives) but also for families. We did scuba, sunset fishing, snorkeling tours with biologist (they have 10 in the hotel) Spa treatments, kids cooking pizza, and did have time to do many other things that we would have loved to. We learnt that the hotel has 400 staff members taking care of the guests. 400 !!!!! You can tell why everything is so perfect. The rooms have incredible amenities, 2 showers that are just wow, and every little detail that you expect from a high standing hotel. This hotel clearly stands out as a 5 stars luxury hotel. I am a world traveller and I stayed in many 5 stars hotels in my life, and this is one that I wil remember for ever. As I said, hard to find areas for development. My only concern, is that both in the way to the hotel and back to Male, the connection with our flights made us wait for 4 hours each way at Mal?? 's airport. Amazing service. All the staff is looking after you constantly and having a GEM has been extremely helpful for our stay. The food is really good. The Chill bar is excellent, we have almost tried all the menu and everything was incredible. The beakfast is very diverse, you have many options to choose. The rooms are very complete. We stayed in the Beach Villa the first night and then we moved to the Water Villa for the rest of the stay and both were perfectly clean and extremely beautiful. Anything a guest can need is in the room. In conclusion, we had an excellent experience in Six Senses. We loved it and we hope we could comeback soon. Thank you to all the staff to make possible a such amazing stay. One of our most memorable trips. We picked Six Senses for our honeymoon. And I am so happy we decided to stay here. Can?? ?t say enough great things about it...the morning breakfast is amazing, the villas are beautiful and private (outdoor shower, deck, glass tub), the service is excellent, and location is unbelievable. Never ever will I see water like this again. We stayed here for a week and had a hard time leaving. If we went back, we would stay here again and have recommended it to all of our friends and family. During our stay, we had used the safe to keep our jewelry secure. Once I got back home to the US, I realized I had forgotten it. (I know right!?!?). The hotel located the jewelry. They made sure the jewelry was packed, safe, taken to the DHL in Male, and sent us a tracking number (we paid for it, of course). They sent us numerous emails to keep us updated on the jewelry. These were gifts and items that were not replaceable. I was so thankful! They went above and beyond during this time. I cannot say enough good things about this place. You won?? ?t regret staying here. Wowwwww!!! I don?? ?t think I have been to a place like this before in my life! I thought we were going to a very cool hotel but never expected to find such an amazing place! Everything from start to end was absolutely perfect. Sustainability is at the heart of everything they do and you realise this quickly after you arrive. We had an incredible time. My kids absolutely loved the kids club, Jovi was amazing and my kids quickly fell in love with her. Ravah our Gem was great as well and did everything for us to have an amazing stay. The spa and yoga studio were awesome, most beautiful yoga studio I have seen in my life! I met so many nice people there that I felt really sad when I left... thinking that maybe I would never seen them again, believe it or not I cried when I was waving my hand at them from the boat. Jovi from the kids club, Katia and Banu from the spa and yoga pavilion and everyone that I came across with, were fantastic!!! They made my stay there unforgettable. Six senses has changed my life for ever, I really hope I can come back one day! After six senses we went to another hotel in the Maldives which was meant to be amazing as well, the truth is that it was very beautiful but nothing compares to six senses! What I have experience there, will stay in my heart for the rest of my life.